You are here: Home » MEDIA » Books » The Sentient Machine by Amir Husain (book review). The Sentient Machine by Amir Husain (book review). 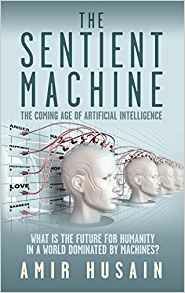 Amir Husain’s book, ‘The Sentient Machine’, provides more information from its sub-titles, ‘The Coming Age Of Artificial Intelligence’ and ‘What Is The Future For Humanity In A World Dominated By Machines?’ I think in this instance, the shorter title works better. From the algorithms that point things to us, let alone the new AIs who would offer help on-line, assuming you let them, the early stages of the acceptance of Artificial Intelligence is already here. Husain’s interest in computers goes back to the old Commodore 64 computer. I used to program on one of its industrial models and suspect that the reason we persevered was because we might get something better one day. Try to write BASIC programming tidily when there is no RENUM factility to open up more lines. A lot of influential people are wary of AI development and I can understand their fear without some protective protocols. Would ‘2001: A Space Odyssey’ had been a different story had the HAL 9000 had a privacy command like it did in the ‘2010’ sequel? Are we are moving far too fast with the near-AI things like Cortana already out there? I still haven’t found a use for it yet as I can do my own research. Look at how many imperfect AI search engine algorithms are on-line at the moment that are still getting near misses. On the other hand, for AIs to learn, then they must have knowledge to learn from their mistakes. Just a shame they don’t appear to be learning. As Husain points out, chess-playing computers just need to run through their rules each time, they don’t need to learn other games like humans do. I wonder how long before an AI can learn and speed up its processing time although what is a few microseconds to a computer? When you realise that it was finally accepted that the brain was the seat of learning for people and not the heart only happened in the late 18th century, we’ve really come a long way since then. Husain also points out how AIs can be incorporated into human abilities to overcome handicaps, which is where Science Fiction territory is bridging into our world. However, for that to be readily done, AIs need to be more generalised than they are now. Looking at his evidence, I tend to think that you only need to get an information absorbing AI right once and the clone the prototype than continually make new ones. Husain is also particularly interested in the AI in the medical field where it can keep track of all illnesses better than human medical staff because of its greater memory. I suspect here, AI and humans will work better together than apart with the latter making the final decision. Seeing all the current medical negligence with breast scanning in the British media recently, it does need something there monitoring discrepancies or patterns that should be monitored. Husain focuses a lot more on the current use of AIs, even if they are more algorithm than purely intellectual to know what it is doing. Although I doubt if an AI would be able to fully understand ethics and choice, if that ever happened and AI refused to do certain actions, then I would think sentience had finally arrived. Something that doesn’t come out about computer software in public utilities is whether or not there is any anti-virus software monitoring anything being introduced into their systems. Certainly, they should have some sort of monitoring, if only if its checksums (that’s an old-fashioned means to check file sizes and raises alarm if they’ve been altered) to ensure there is no unauthorised tampering. Certainly, we all know about monitoring people in the streets and buildings and that has to be computer controlled because there isn’t enough organic coverage. Something that Husain doesn’t cover is how easy it is to hide a USB memory finger and how easy it is to plug into computers to retrieve files. There is always a human element in all of this. It shows how up-to-date this book is when Husain discusses information gathering and manipulation by the likes of Cambridge Analytical. That speaks its own story when the original researcher, Michael Kosinski, wanted nothing to do such activity. It certainly needs some laws to make such activity illegal in the likes of elections or we’ll have even bigger calamities than we are currently seeing. Of course, even with elections, there has always been an element of gerrymandering in politics but such holes are generally blocked. Electronically, we can only discover such actions after the fact. What makes what Cambridge Analytical did really bad was not enough people were realising that they were being manipulated by advertising techniques. I’m glad I never wanted to get into social media websites. I do think more people need to be aware of how they can be manipulated and how to be aware of it. The final section on the future of AI doesn’t and tends to appear as if Husain had run out of ideas as he doesn’t make any arguments for and against what will happen in the future. This, to me, looks like a missed opportunity. Nevertheless, the rest of the book will make you think more about current algorithms more than AIs. It also makes me think we really need a book on these algorithms and just what they are doing to your lives and whether you want them to do so or not. After all, you’re not being given any choice once you sign into them. « Star*Reach Companion by Richard Arndt (book review).